Discussion in 'General' started by JeffM, Sep 10, 2013. I am concerned my 08 K9 is going to fall over when i place it on the stand. It became more evident when i was on my week long trip and was loaded up. Can someone with access to a digital level place it accross their back wheel and give me the angle of lean. It worries my that i may come out of the bar and find my Dog in the gutter. Jeff, I am sure you already have done this, but.... Did you check the bolts making sure they are tight? and, check the stand itself for peeling chrome and/or any other signs of it bending? Just my thoughts. These kickstands do wear out near the front edge and when they get bad enough they can fold forward and drop the bike. 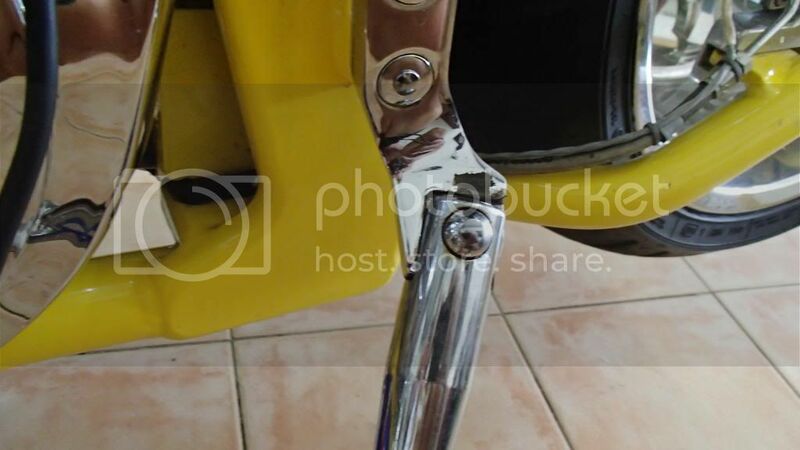 Check to make sure the stand pivot bolt and spacer are okay and check the forward stop on the mount and stand. The center bolt can loosen as well. There is a alternate replacement available but you will need to search the forum for it. I had the same issue with mine, it was worn out. I replaced it with an Arlen Ness adjustable kickstand. This one was expensive but seems very sturdy. I added a washer to mine, and it really improved how much it leaned over. 2005 BDM Choppa "Wild Fire", 2011 Electra Glide Ultra Limited "Swamp Rat"
That was gonna be my suggestion, I know that several have gone that route..
Do you have a picture of this fix? Thanks for the detailed info Ron. We have a machine shop at work and I'll probably take a stab at it shortly. Thanks one and all for your responses. 1. The bush is snug and the bolt is in good condition with no steps or signs of wear. 3. 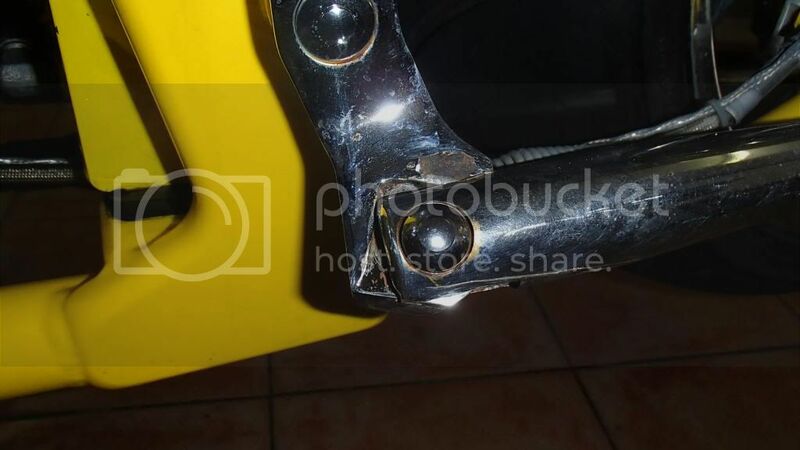 The part that attaches to the frame may be bent, although no signs of cracking chrome evident. 4. Is the hole that the bush sits into supposed to be elongated or is the bush supposed to be a press in fit? Not interested in anything Arlen Ness has to fit a BDM.............sorry. Mine leans over way too far also. I tightened it up with a thin bronze washer and drilled the mount for a roll pin that prevents the kickstand from folding forward. Found that fix on a thread here. Picture before fix: Let me know if you want a picture of the lean now, there's not a lot of difference. Took a picture so I could see if there is any difference. It might be worst. 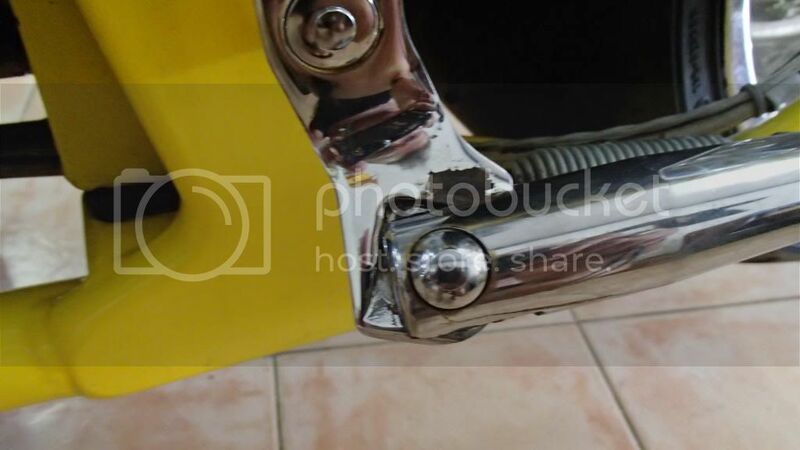 Also picture of the roll pin installed that keeps the stand from folding forward if it gets too worn. I will be replacing the stand this winter. Yep thats about it, if i put on slopping ground i'm afraid it will fall over. Spoke to Donna a few months ago (well email) they have them for $168 US + P&H. No one has answered regarding wether the hole is supposed to be elongates or not. I can drill out to the elongated size and spin a bush to suit the bolt and new hole size if that is the issue. Mine kickstand looks just like the above picture without the roll pin. It seems to be positioned right and rests on the front edge between the slot. I don't believe this will wear out so I am going to leave mine alone. Franco, is your hole on the fixed part elongated with the bush slopping around or is the hole same same as the bush with little to no movement?